With images of war haunting him daily, U.S. Army veteran River Roulet cannot seem to break free of the past. Awake or asleep, it’s impossible to forget the bombs, the death, and the trembling of the earth. In a desperate attempt to distract himself from these horrors, he flees to Brazil, hoping the rich landscape and vibrant culture of Rio de Janeiro will drown out the nightmares. When he arrives the city is preparing for Carnaval and the celebratory goings-on are everything he hoped they would be, and he seems on the surface to be finally getting his life back together. This stab at a new life takes an unexpected turn when River meets Natal, an impassioned journalist and free spirit who lives with Tio Amato, a notorious drug lord. Her presence in his life rekindles a curiosity for the world that River thought was lost to him forever. It also catapults him back into the life of danger and violence he so desperately sought to escape. As their relationship starts to blossoms into something more, River kills one of Tio's men, and they must flee the city, pursued by the drug lord and the Brazilian government. During this time River has to use every trick in his arsenal to stay alive. Will River and Natal escape Brazil and will he ever be free of the memories that haunt him? 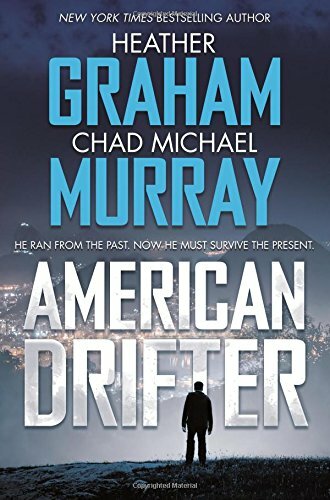 In American Drifter, Heather Graham and Chad Michael Murray team up to write an electrifying and suspense filled story that is loaded with plenty of twists and turn. Graham is the New York Times bestselling and award-winning author of over 100 novels and novellas. Murray is an actor, spokesperson, and former fashion model who has appeared in numerous television series and movies that include One Tree Hill, Agent Carter, Fruitvale Station, and Outlaws and Angels. American Drifter serves as Murray's debut novel. The plotline and character development which includes love, loss, and redemption is well written but a little stereotypical at times. River and Natal’s love affair appears on the surface to be a little too perfect and over simplified, and because of this it is hard to imagine that this would actually work in real life. While the plot twists are predictable and cliché the novel does a good job of compensating for these minor flaws with its colorful setting and atmosphere. Overall, Graham and Murray have produced a worthwhile novel that is sure to be an instant bestseller. The exotic locale of South America and Carnaval will most certainly be enough to keep the reader’s attention and there’s plenty of romance and suspense to go around. Fans of the thriller/suspense genre will not be disappointed.